We looked before at skirts when we made the Perfect Maxi Skirt. If you take a straight skirt which is hip width and then simply entend it down to the floor, you won't be able to walk properly, you'll only be able to move your legs as wide as your hips. This works OK in a knee length skirt but not in a maxi. At the same time, we don't necessarily want to add a lot of volume to the skirt all over so there is more fabric at waist and hip to be gathered in. So I used the same idea on the Perfect Maxi Skirt to extend and increase the flare slightly on the Wrap Dress skirt. I also made sure to use the whole width of my fabric too. I changed the shape of the sleeves to give them a looser more summery look too. Both are very simple changes you can make to this, or any pattern, to change up the look. I'll show you how to do these simple pattern hacks in the video below. 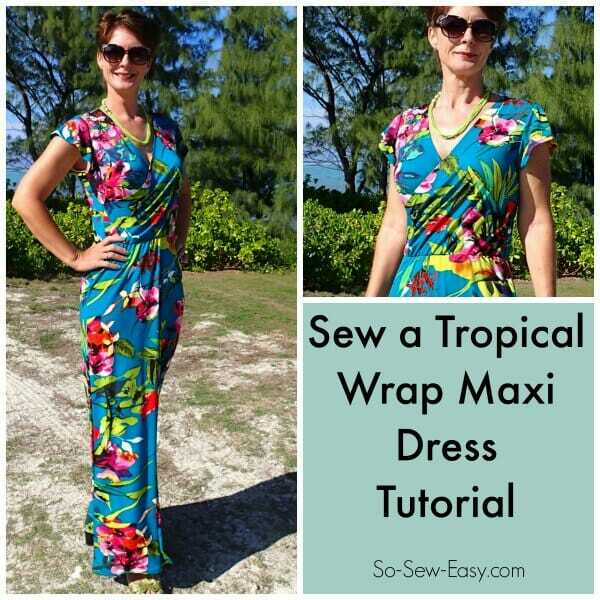 The video below covers the two different pattern hacks to convert the wrap dress into a maxi with flutter sleeves, and also has the full sewing step by step too. So if you've not yet made the original wrap dress, there are some pointers here that might be useful. It's a very quick and easy to sew dress, has optional elastic at the waist and I'll be wearing mine everywhere! 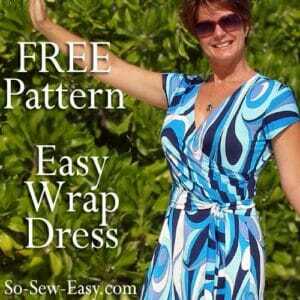 If you want to see the step by step sewing instructions in word and picture format, these are included in the pattern download and are also in the original article about the wrap dress here. Give this one a try, I think you'll like it. Or start out with the original Wrap Dress too. Either way, please do come share what you sew in our sewing chat group on Facebook. 24hr sewing chat, inspiration and sharing – on all sorts of sewing activities! We can't wait to see what fabric you use for your maxi dress. This is so beautiful! Thanks so much! I am a size 14-16, big busted and a bit of a tummy, and I need a style that flows for a cruise. This dress is too covered in the top. Do you have any styles that I can download to make for cruising in a flowing fabric please. I think an empire halter dress might work for you, when is your cruise? Yeah, my first real sewing project is finished! I love it! Fantastic Judith! Thanks so much for sharing. The dress looks great. Lovely dress. How much fabric do I need to make it? Hi Elaine, it’s really going to depend on the size you choose to make. The pattern is free so suggest you download and do your calculations. This is a maxi dress so you’re going to need a reasonable amount of fabric as dresses go. I’m sure you’ll enjoy this one. Please let us know how you go. Thank you for another great tutorial. Do you use a straight stitch or a stretch stitch? If you are using a twin needle use a straight stitch, if you are using a ballpoint needle use a stretch stitch. I absolutely love this dress and I’m going to attempt to make it. I downloaded the pattern and put most of it together. When I came to the back bodice pieces I could not match the connections. It seems that pieces #18, 19,20, and 21 are a smaller scale and do not match up with the other 4 pieces of the back bodice. I had no problem with the rest of the pattern. I am fiddling with my printer to try to enlarge those four pattern pieces to match with the rest of the back bodice. I hope I don’t screw it up. I have moderate experience in sewing and this dress looks like something I could do. By the way you look amazing in this dress. Love the dress and the fabric. I need to make it for my class reunion in Puerto Rico. 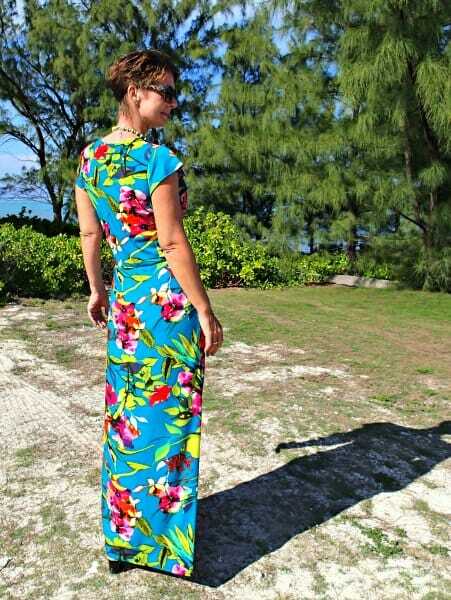 Where can I get the fabric, or similar, love the hibiscus and it is a tropical flower. I bought this one from Fabric Mart, but its all sold out now. When you see something there, you have to be fast! You might try fabric.com, they often have a wide range of knit prints. I hope you find what you are looking for and have a great time at the reunion. Thank you, thank you, thank you! I have been wanting a nice maxi dress, and everything in the stores is either 100% polyester (sweaty!!) or is non bra compatible. This looks so lovely! Yay…..my favorite maxi skirt to make now a full dress….love it………. Wow Deby, you look beautiful ! Blush, thank you so much Calditer – honestly, it’s all the dress! No it’s not! I’ve noticed you trimmed down to. You really look different. I had to look twice to make sure it is indeed you! Beautiful Deby, absolutely beautiful ! I do love the fabric also. Thank you, a beautifully made tutorial. I was reminded how easy it was to alter a pattern which I used to do for my daughter. I always try to buy ‘nice’ long dresses with a sleeve and fail miserably, so I guess I will be trying to find decent material in UK. That is getting more difficult each year. Very feminine and elegant. I’m very tempted to give this a try. this is the first video I have watched of yours and you are doing an excellent job with your tutorials. Thank you for your time and help. 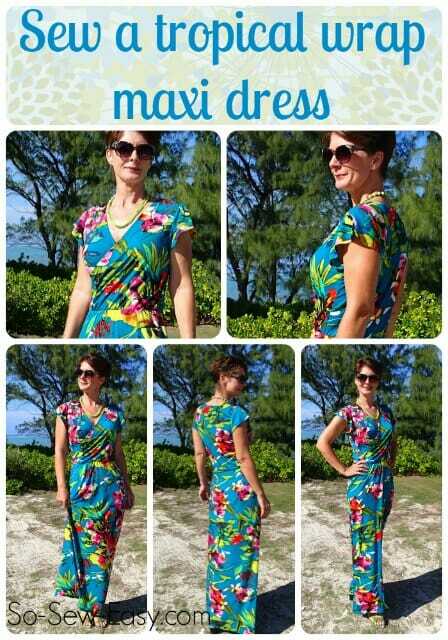 I am very short and think I look very silly in maxi dresses but I may make this because your version is so slimming. 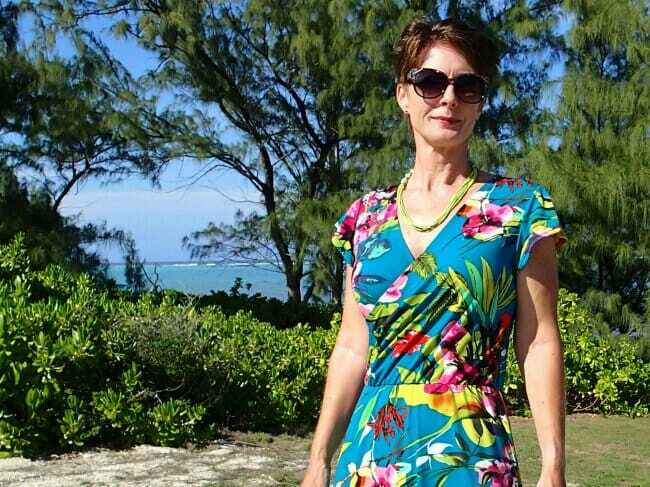 Deby, I agree, you look fabulous! Love this maxi dress style. 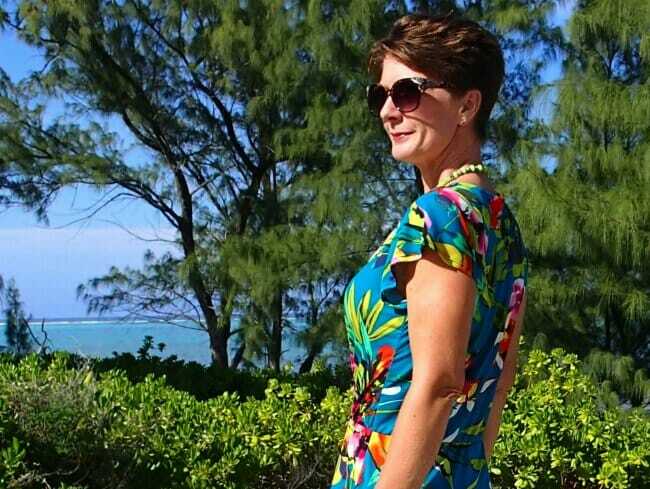 Deby, you look absolutely fabulous in this and a little thinner too, if that isn’t too personal! Thank you Gill, it’s my new favorite. I think the length on a maxi dress always makes the wearer look taller and slimmer, although I have lost s few pounds this year too.